We have the most diverse selection of Dress Up and Time Period Walking Canes you will ever see. There are Walking Canes to accessorize any Theatrical Costume or Formal Themed Attire Event or Special Occasion. Here a a few of the Unique Types of Walking Canes we keep in stock: Mystical Theme Walking Canes, Steampunk Style Walking Canes, Victorian Gentleman”s Walking Canes, Magical & Goth Walking Canes, Vampire Walking Canes and so many more Styles. 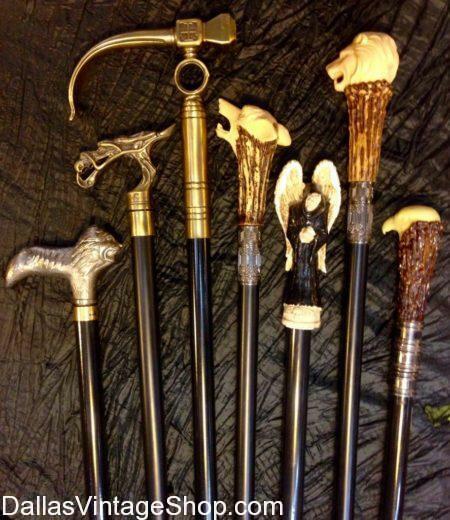 Look at these Lion Head Walking Canes, Wolf Head Walking Canes, Eagle Head Walking Canes, Death Angel Walking Cane, Faux Ivory Walking Canes, Fantasy Dragon Walking Cane, Steampunk Gothic Walking Cane and there are many, many others besides these pictured here. This entry is filed under Walking Canes. You can follow any responses to this entry through the RSS 2.0 feed. Both comments and pings are currently closed.